Dr Alison Gardner published a refreshing and much-needed examination of partnership approaches to tackling modern slavery, or human trafficking in our vernacular at the Laboratory to Combat Human Trafficking (LCHT). The guiding international “4P framework” of Prevention, Protection, Prosecution and Partnership needs to be tested as a comprehensive model, as it is touted, and Dr Gardner’s work advances our understanding of partnership promising practices. Further, while each role and strategy in the anti-trafficking movement is important, no single organization can address human trafficking comprehensively. An investment in any single part of a community response will ultimately fail to address all root causes of human trafficking and risk that survivors will continue to slip through the gaps. As the anti-trafficking movement reflects upon the 19 years since the passage of the United Nations Protocol to Prevent, Suppress and Punish Trafficking in Persons (Palermo Protocol), the crime has expanded and the response to it has become more sophisticated. With the signing of the Palermo Protocol, countries implemented their own national laws drawing from the UN definition, such as the federal Trafficking Victims Protection Act, which was passed in the United States in 2000. But in contrast to other social movements, the national anti-trafficking movement began with a top-down approach based on legislative definitions and directives, rather than as a bottom-up, grassroots experience. Federal disbursements of taskforce funding poured out for cities around the U.S. to prioritize the development and coordination of a response to human trafficking. At the local and statewide level, this was viewed as a mandate to examine a crime that was allegedly occurring within a given geographic scope, but the priority emerged from “outsiders” who lacked contextual knowledge of how trafficking looks locally. In response to that top-down approach, LCHT launched research efforts to explore our state’s understanding of the crime. Since 2012, we’ve tracked efforts in a single U.S. state, Colorado, aimed at ending human trafficking – our baseline assessment. The Colorado Project to Comprehensively End Human Trafficking follows one broad research question: What would it take to end human trafficking in Colorado? The Colorado Project 2.0 (CP2.0) represents an important milestone in that journey as this is the first replication of the original Colorado Project published in 2013. The community-based, participatory research project collected data on each of the 4Ps. We appreciate and echo the national, regional and local focus that Dr Gardner utilized. Dr Gardner’s research points to seemingly similar strengths and challenges in the United Kingdom that we found in Colorado. Strengths consistent across geographies appeared in the capacity of partnerships to raise awareness, share information, and conduct extensive efforts to train on human trafficking, especially trainings targeted at front-line staff in public-serving agencies. It would appear that UK multi-agency partnerships face similar challenges that we find in our home state of Colorado: a lack of shared language, including a definition of trafficking; a lack of dedicated funding or resource streams; the need for more representative membership, especially survivor involvement; goals or outcomes that are not clearly defined; and the need for better data tracking and/or sharing. Based on our research in Colorado and Dr Gardner’s work in the UK, we would like to draw further attention to two specific issues. First, measurement and evaluation of partnership efforts remains lacking. Second, there must be room for survivor leadership in each and every partnership effort. The IASC toolkit creates a useful starting point for setting shared partnership goals, developing trust among partners and identifying outcomes as markers of progress. Established partnerships, and long-established, parallel movement groups adopting trafficking as a mission, provide bounded samples and a visual mapping of anti-trafficking momentum across a given community, region or state. Engaging with practitioners, as in Dr Gardner’s study, allows for “boots-on-the-ground” perspectives. 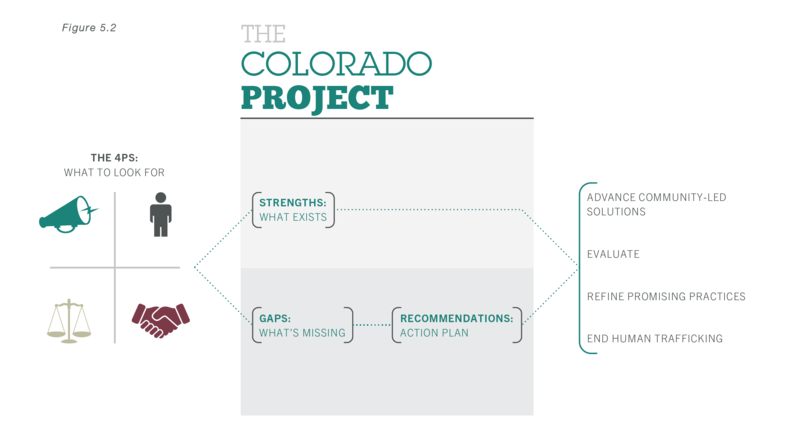 The research design, data collection and analysis stages of the Colorado Project incorporated survivors, researchers, and practitioner perspectives. By embedding this array of voices, one sector is not prioritized over another, and a level playing field is established in terms of expertise. The outcome of that shared research effort is the Colorado Project 2.0 Action Plan. The Action Plan 2.0 created a roadmap to prioritize statewide and regional efforts against human trafficking. Practitioners, survivors and researchers viewed data from 17 partnerships and 29 focus groups across the state, combined with 76 additional organizational-level interviews and 183 survey responses, to guide the creation of this Action Plan. Survivors led the review of each recommendation in the Action Plan to ensure our guidance is both trauma-informed and supported by voices with lived experience. Supporting and sharing lessons learned from local partnerships will be paramount to global progress in ending human trafficking. A piecemeal approach has proven ineffective in ending human trafficking. Like many human rights movements, collaborative work takes time and requires carefully tended trust between sectors and disciplines in order to lay the groundwork for social change. We suggest that one key indicator of successful partnerships will be the trust they are able to build and maintain through achieving shared goals. Trust, a fundamental aspect of the movement, will be the key as we strive to connect across top-down and grassroots efforts. Participants in both studies cite funding as one additional challenge for maintaining successful, long-term partnerships. Unlike the UK, Colorado participants observed that funding was not exactly the limitation, instead, a lack of key community services like healthcare, housing, addiction treatment or living wage jobs appeared to be root causes of trafficking. We wholeheartedly embrace the recommendations across leadership, engagement, accountability and funding in the Collaborating for Freedom research report, while simultaneously suggesting that attention to addressing root causes, seamless integration across other forms of protection services, survivor-led partnerships and support for prosecution of adult and labor trafficking crimes are essential to multi-agency efforts. In our minds, focusing efforts to end trafficking in these ways will help maintain a sustainable, effective and comprehensive movement that coalesces across the gap between top-down and grassroots approaches. Annie Miller, Ph.D. is an Assistant Professor at Washburn University. Amanda Finger is the Executive Director of the Laboratory to Combat Human Trafficking. This article has been prepared by Annie Miller and Amanda Finger as contributors to Delta 8.7. 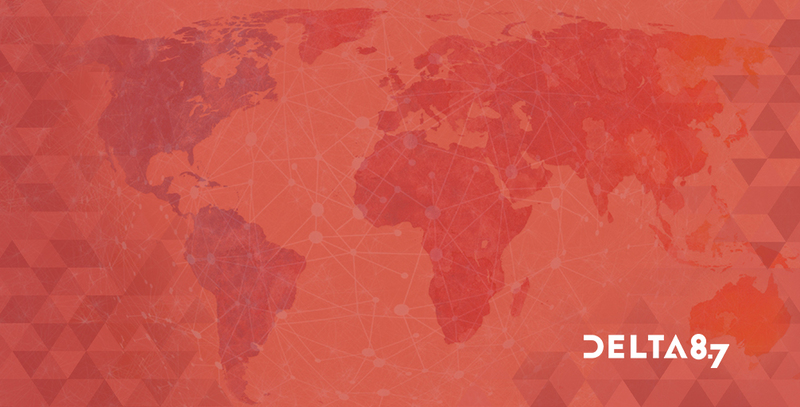 As provided for in the Terms and Conditions of Use of Delta 8.7, the opinions expressed in this article are those of the author and do not necessarily reflect those of UNU or its partners.